Why use equipment when you can just use bodyweight? Whether you’re training at home or in nature, it’s easy to opt for the no-equipment route. You can perform push-ups, squats, crunches and other exercises by simply using your bodyweight as the sole source of resistance. 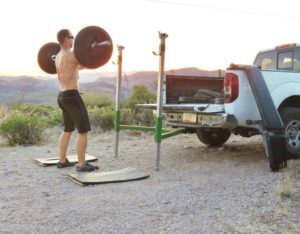 Bodyweight training largely requires no equipment and is as portable as you are. So, to get back to my starting question…why use equipment? Equipment provides more resistance, and a challenging resistance is necessary to maximize your results. According to a new study, resistance matters…it matters a great deal. Your muscles know the difference between many reps with light resistance and fewer reps with a heavier weight. It’s also clear that your muscles prefer one over the other. The study, a collaborative effort from researchers at three American universities, tested men on one of two routines: a low-weight/high-rep routine or a high-weight/low-rep routine. Men in both routines trained to complete exhaustion on every set and were trained for six weeks. The low-weight group performed three times the amount of reps…yet gained less strength and muscle! In fact, strength increased by 28% in the high-weight group versus only 10% for the low-weight group. Electrical recordings of muscle tissue also showed the high-weight group used progressively more muscle fibers throughout the six weeks. On the other hand, the low-weight group used more muscle fibers for the first few weeks, but then plateaued after that. The use of more muscle fibers means the high-weight training provides a greater challenge to the trained muscles. Also, it could explain why high-weight is more effective for gaining strength and muscle (more fibers trained means more fibers respond to the training). More importantly, how does this relate to you? While bodyweight exercises, bands, light dumbbells, and other objects that may provide a minimal amount of resistance could seem appealing, they likely won’t help you develop the muscle and strength you’re looking for. You can achieve a challenging workout with light resistance, but exceptional long-term results aren’t likely. This is the value of the RigRack: it enables you to train anywhere with an effective amount of resistance. Use a front squat with a barbell instead of bodyweight squats. Perform the bench press over push-ups. Include a barbell with your lunges in place of bodyweight lunges. A challenging resistance is necessary to maximize your muscle and strength gains. Jenkins, N.D., Miramonti, A.A., Hill, E.C., Smith, C.M., Cochrane-Snyman, K.C., Housh, T.J., & Cramer, J.T. (2017). Greater neural adaptations following high- vs. low-load resistance training. Frontiers in Physiology, 8, 331.